I used Ice Yarns - Magic Light for this bonnet which gives a unique self striping effect. This yarn is a #3 light yarn and can be found in my yarn shop or maybe you could find something similar from Red Heart Yarns. I originally wrote this pattern in 2014 and I decided recently to make it available on my blog for download. If you hook up this Crochet Snow Flower Bonnet I'd love to see. Please consider hooking up your project on Ravelry, don't know how to hook up a project? Check out this easy peasy tutorial I made HERE. Crochet Snow Flower Bonnet Pattern Notes..
Yarn: Less than half a ball of #3 (100gr/360m) Ice Yarns - Magic Light. Notes: Need some help adding braided ties? Check out the tutorial I made HERE. Please note that some hospitals will not accept donations if there are ties, check with your local hospital before donating. 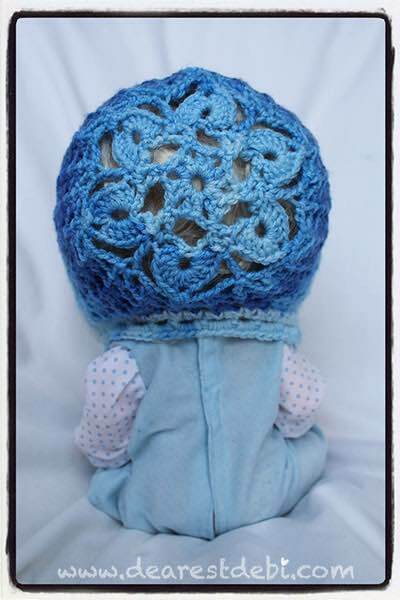 Crochet Snow Flower Bonnet Pattern..
Have you made your own Crochet Snow Flower Bonnet? Please share your pictures on my Facebook WALL or 'hook up' your project on Ravelry. I’m glad you were able to figure it out ☺️ would love to see what you hook up.